Robo Raven is a truly clever robot flier—it can dive, spiral, even back flip. Although up close, Robo Raven’s reflective body doesn’t look very hawk-like, its wing motion and silhouette are realistic enough to fool a hawk into attacking it. (Not unlike a Liquid Robotics Wave Glider that was “investigated” by a shark in the Pacific Ocean.) See below for a little robot/bird diplomacy. 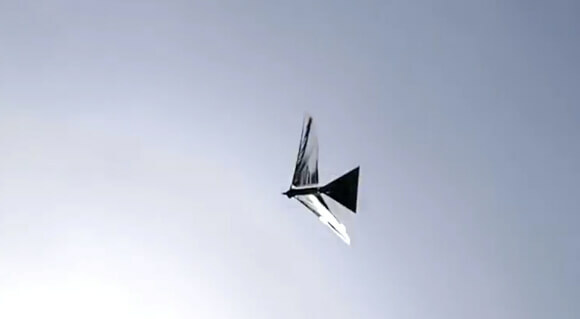 What enables Robo Raven’s impressive aerobatics? Independently flapping wings. It took the team eight years and a number of failed prototypes to arrive at this stage. Wing independence requires a heavier microcontroller and battery. To trim the robot’s total weight, the team turned to modern fabrication techniques to 3D print and laser cut light polymer parts. As for those tricky moves, with their independently flapping wings the team can now program and run any wing motion they like. Researchers say bird and insect-inspired flying robots may fill a particular niche in the drone market. Though they may not have the payload capacity of fixed wing craft or quadcopters, they can be more efficient fliers. Further, mimicking bird-like behavior, these robots can vary wing speed, flap wings independently, even change wing shape mid-flight. These characteristics make them more versatile fliers, able to stop and start quickly, fly forward and backward, hover, perch, and generally, better adapt to changing aerodynamic properties of the air. Further, while a drone is fairly obvious once spotted, the bird-like flying robots may be quieter and lower profile (for better or worse). These new bots are right out of Da Vinci’s notebooks. Only now, five centuries later, has the technology caught up to the idea. Advances in miniature computing, lightweight structural materials, and more efficient, lighter batteries are finally enabling machines to fly like birds.